Back then, this book inspired me to add Switzerland to my list of places to visit. Now, the concept of “bloomability,” the opportunity to grow, is one of the many ways to describe studying abroad. My friend Emma, who studied in Chile this fall, gave me a scrapbook for Christmas labeled, “Erin’s Bloomability Book.” She explained how studying abroad really is a time where you will “bloom,” grow in ways you wouldn’t in your comfort zone at home. While I have weeks of bloomability ahead of me, this weekend I had the chance to travel to Switzerland. Though I did not visit Lugano, I found the same peaceful beauty in Interlaken. Lake Brienz. Yes, it really is that blue! I went with three girls from my apartment and a few other students from my program. We traveled through a company called Bus2Alps that designs trips specifically for students studying abroad. So we got on a bus around 8:00 p.m. on Thursday night and arrived in Interlaken around 7:00 a.m. Friday morning. I went on a snowshoe tour guided by Peter who’s a fan of Pittsburgh because Jaromir Jagr played for the Pens. He’s from the Czech Republic and lives in Bali teaching surfing most of the year except for a few months in the winter spent in Interlaken teaching snowboarding, skiing, and leading tours. We took a cable car from Isenfluh to Sulwald where we hiked up the mountain listening to stories about the farmers that live there and the towns that can be seen down in the valley below. The second part of the hike, running and falling into the fresh powder on the way down the slope back to Sulwald, was the most fun I’ve had in awhile. Saturday we went on a day trip to Zurich. This is definitely the most calm city I have ever visited. And I have never seen a river running through a city be so clear that you can see the rocks and lost phones beneath the water. We climbed to the top of one of the towers of the Grossmünster church for an incredible view of the city. View of the lake from the tower. Back in Interlaken we went out for cheese fondue and bought chocolate. Interlaken is probably not alone in their pride of Swiss dairy products that is highlighted by the presence of cows for decoration throughout the town. In the morning I walked to Lake Brienze with a friend, bought some chocolate to take home, and had hot chocolate before getting on the bus back to Rome. Overall, Switzerland’s beauty was unreal. 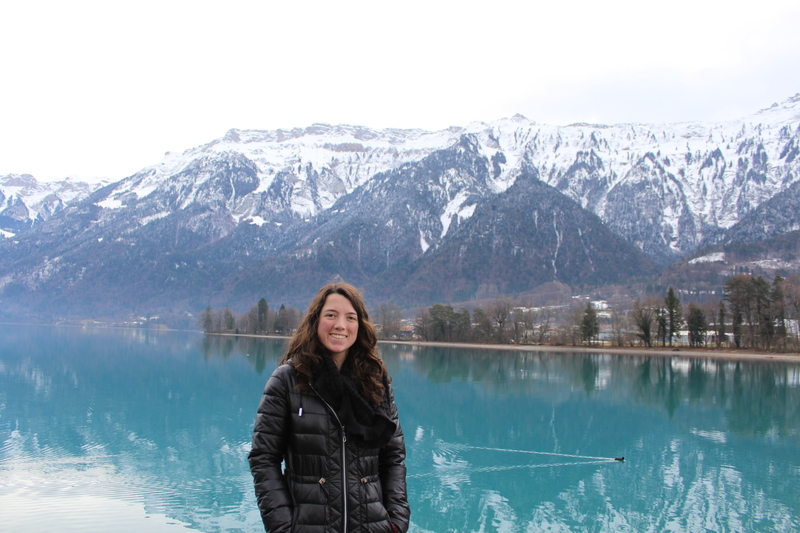 The peace and calm of of Interlaken was a welcome break from the hustle of life in Rome. I am looking forward to the bloomability of traveling there again someday. Yes, Switzerland is one of the most spectacularly beautiful countries in Europe. Thanks for your pictures and your comments.